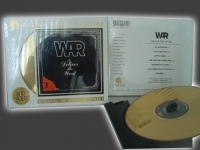 War Avenue Limited Edition, Out of Print 24k Gold Audiophile CDs use the Digital 20 process, which is a special 20-bit digital mastering process that are manufactured from the original master tapes with the original producer assisting in the production. You will be one of the last people in the world to own these Limited Edition Long Out of Print Masterpieces that will add true value to your Collection. 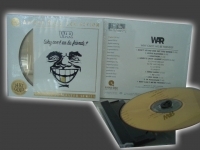 "Eric Burdon, Declares War Factory Sealed 24 Karat Gold CD - CURRENTLY OUT OF STOCK"
Avenue Gold 24K CD. Tracks Include: "The Vision Of Rassan: a)Dedication; b)Roll On Kirk" "Tobacco Road: a)Tobacco Road; b)I Have A Dream; c)Tobacco Road" "Spill The Wine" "Blues For Memphis Slim: a)Birth; b)Mother Earth; c)Mr. Charlie; d)Danish Pastry; e)Mother Earth" "You're No Stranger". Avenue Gold 24K CD. War came to notoriety as former Animals lead singer Eric Burdon's backup band. After two albums, Burdon no longer employed the band and they struck out on their own. They released their disjointed self-titled debut album that went nowhere on the charts. They appeared ready to drop out of sight, but they released this album and proved that they were more than just a back up band. ALL DAY MUSIC showcased their ability to mix rock, jazz, R&B and Latin influences and bounce effortlessly between styles. "Slippin' Into Darkness" is a funky burner while the title song is a laid back breezy pop tune. They can slow it down on "That's What Love Will Do" or rock out on the live "Baby Brother". War was always a great jam band who had the ability to catchy music and this album is a great introduction to that. Tracks include: All Day Music - Get Down - That's What Love Will Do - There Must Be A Reason - Nappy Head - Slippin' Into Darkness and Baby Brother. AVENUE GOLD COLLECTION. This 24-Karat Gold Limited Edition FACTORY SEALED CD is an audiophile collector's item that simply gives the feeling of being directly in the studio with the artist. DIGITAL 20 MASTER SERIES - DIGITAL 20 is a special 20 bit digital mastering process. Each disc is guaranteed to have been manufactured from First Generation Master Tapes. The original producer has assisted in the production to insure the finest possible sound. The disc is custom pressed using 24-Karat Gold (known for its superior qualities and resistance to oxidation). "War, Deliver the Word - Factory Sealed 24-Karat Gold CD"
Established as bona fide hit makers thanks to the success of the albums All Day Music and The World Is a Ghetto, the Los Angeles-based seven-man group War aimed for a hat trick with the 1973 album Deliver the Word. Less mainstream in its approach than its chart-topping predecessors, the seven-cut set boasted just one hit in the form of the groove-flavored "Gypsy Man," a top 10 pop and R&B single in the summer of '73. Exploring Latin rhythms, funk, jazz, and rock, DELIVER THE WORD stretched musical boundaries. One of the true standouts was the catchy "Me and Baby Brother," which should have been a much bigger hit for the band. The album's title cut was a brilliant soulful ballad, while "Blisters" was a fine bluesy close for the album which, in spite of its lack of hit singles, became the band's third gold LP in succession. Tracks include: . H2overture -. In Your Eyes -. Gypsy Man -. Me and Baby Brother - Deliver the Word - Southern Part of Texas -. Blisters AVENUE GOLD COLLECTION. This 24-Karat Gold Limited Edition FACTORY SEALED CD is an audiophile collector's item that simply gives the feeling of being directly in the studio with the artist. DIGITAL 20 MASTER SERIES - DIGITAL 20 is a special 20 bit digital mastering process. Each disc is guaranteed to have been manufactured from First Generation Master Tapes. The original producer has assisted in the production to insure the finest possible sound. The disc is custom pressed using 24-Karat Gold (known for its superior qualities and resistance to oxidation). This Out of Print Gold bonafide collectible disc has all Liner Notes, Photos, and Artwork from the Original LP faithfully recreated. Avenue Gold 24K CD. Tracks Include: "War Is Coming! War Is Coming!" "Slowly We Walk Together" "Platinum Jazz" "I Got You" "LA. Sunshine" "River Niger" "H2 Overture" "City,Country,City" "Smile Happy" "Deliver The Word" "Nappy Head (Theme from ghetto man) " "Four Cornered Room". "War, The World Is A Ghetto - Last Copy"
Avenue Gold 24K CD. On THE WORLD IS A GHETTO, War's artistic vision moves one step beyond the preceding ALL DAY MUSIC. The band's multicultural musical stew is better blended, the social commentary of its lyrics more pointed, and its grooves are tighter and meaner. As the title indicates, THE WORLD IS A GHETTO is a dark album, but in the best possible sense--deep, thick beats predominate, as on the alternately punchy and dreamy title cut and the hypnotic "Four Cornered Room." The irresistible "The Cisco Kid" marries a slow Latin rhythm to pulsing funk on a song about the 1950s television hero, and the lively combination sent the tune up the charts. The syncopated backbeat to the New Orleans-flavored "Where Was You At" is infectious, while "City, Country, City" is an extended instrumental that allows each band member to stretch out with Latin, R&B, and jazz-inspired improvisations. One of the best-selling albums of '73, this disc is arguably War's finest. Tracks Include: "The Cisco Kid" "Where Was You At" "City, Country, City" "Four Cornered Room" "The World Is A Ghetto" "Beetles In The Bog"